Back in the day, radio broadcasts of American baseball games were local affairs. There was no satellite feed, or high-quality landline, or other means of a broadcaster in a distant city to sit in the booth at the game and do a play-by-play broadcast back to the visiting team’s home city. Instead, there would be a telegraph feed from the distant stadium back to the radio station, and a stringer at the game would telegraph back what was happening. The broadcaster, sitting in a studio hundreds of miles from the game, would read the telegraph reports and make up the details of what was happening as he pretended to be watching the game live. I know how they felt. I’ve usually counted on fotbolti.net’s live blogs to keep up with Vikingur Olafsvik matches and to write up match summaries, but they weren’t able to send anyone to today’s match. So they had someone at the stadium making phone calls to their reporter in Vestmannaeyju when something happened, and he would then post it to their live blog. Not exactly the highest-fidelity information channel. So, suffice to say that though Vikingur apparently had better control of the game in the first half, they weren’t able to score, and fell behind 1-0 when Garðar Bergmann Gunnlaugsson put a rebound into the net. Friend of the Blog Eyþór Helgi Birgisson looked to have scored in the 29th minute but the goal was disallowed (I think I saw something about a corner, so I’m just going to claim that he scored off a corner but the referee disallowed the goal due to a foul on Vikingur). The game remained 1-0 Akranes until the 80th minute, when Akranes keeper Páll Gísli Jónsson sent a goal kick deep, and Hjörtur Júlíus Hjartarson ran onto it and beat Vikingur keeper Arnar Darri Pétursson. Akranes scored again four minutes later to go up 3-0, and a foul on Eyþór Helgi in the box with the penalty again converted by Þorsteinn Már Ragnarsson like in the last match did no more than make the score look somewhat respectable. All in all a disappointing day, with Vikingur Ol falling to fifth place, five points behind second-place Akranes and trailing significantly on goal differential. The team is off until Saturday the 9th of August, when they face 10th-place Grindavik. Ideally it will be a chance to make up some ground, but Grindavik actually has a better goal differential than Vikingur, has been in better form over the past five matches, and has a lot to play for, being only two points clear of the drop zone. This, however, IS a converted penalty kick. 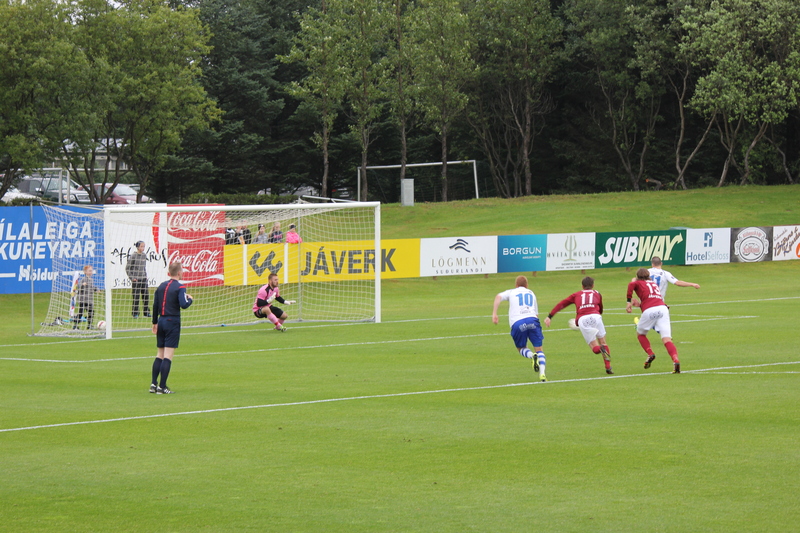 A supporter has graciously started sharing some pictures from recent Vikingur Ólafsvik matches. 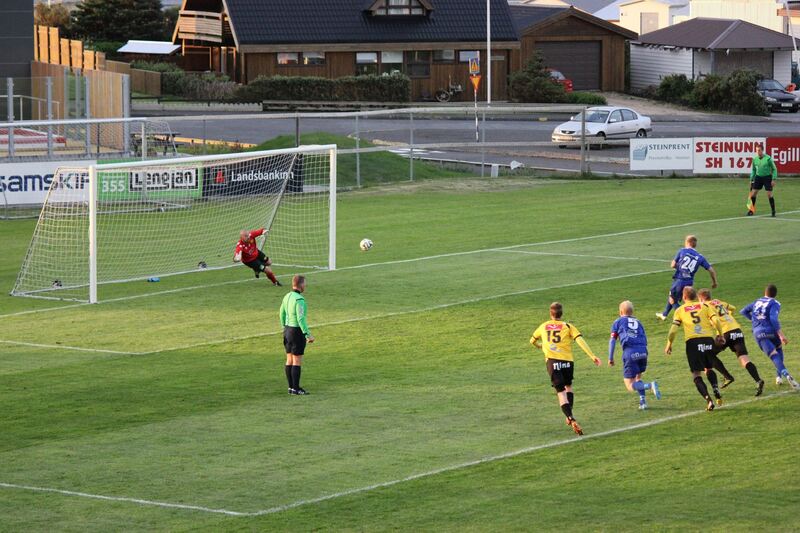 First up is Friend of the Blog Eyþór Helgi Birgisson converting his penalty kick in the 17th minute against Selfoss. In what is looking like a very positive acquisition, Olafsvik’s Own Þorsteinn Már Ragnarsson has returned to Vikingur Ol on a loan from KR Reykjavik. Þorsteinn Már grew up in Olafsvik and played for Vikingur in 2011, appearing in 18 matches and scoring 6 goals including a brace in a 2-1 victory over Þrottur. He went to Falkenbergs FF in Norway on a free transfer at the end of the 2011 season, but did not appear on the squad before being transferred to KR before the 2012 season. For KR, Þorsteinn Már appeared in 68 matches, scoring 13 goals and adding two assists. He immediately made an impact on his return to Vikingur, drawing a penalty that Eyþór Helgi Birgisson converted to put the squad up 1-0 against Selfoss, and scoring himself in the second half. He appeared to link up well with Eyþór Helgi throughout the match, and looks to bring an increased goal-scoring threat through the center of the pitch to Vikingur’s attack. Þorsteinn Már is the twin brother of striker Steinar Már Ragnarsson, and we hope that the twins pair up well over the rest of the campaign. Þorsteinn Már Ragnarsson made a major impact in his first match for Vikingur Ol after arriving on loan from KR. Þorsteinn Már, who is the twin brother of Vikingur striker Steinar Már Ragnarsson, drew a foul in the box leading to an Eyþór Helgi Birgisson penalty 17 minutes into the match, and scored a goal of his own on a counterattack in the 64th minute to lead Vikingur Ol to a 2-0 victory in Selfoss. Selfoss started strong, forcing Vikingur keeper Arnar Darri Pétursson into several saves in the first ten minutes, but when Þorsteinn Már got taken down in the box by Selfoss keeper Vignir Jóhannesson, the referee pointed straight to the spot. Eyþór Helgi confidently sent Jóhannesson the wrong way, putting Vikingur Ol up 1-0 early. Þorsteinn Már and Eyþór Helgi continued linking well throughout the first half, with Samu Jimenez just missing after a good buildup in the 40th minute. After halftime things slowed down, with neither side getting many opportunities, until Þorsteinn Már got a breakaway, outrunning Selfoss defender Andrew Pew and beating the keeper for his first goal in the white and blue. Selfoss’s best chance came about five minutes later, when Ragnar Þór Gunnarsson hit the crossbar off a header, but they never seriously threatened the Vikingur lead. Hackettstown’s Own Joey Spivack came in as a late substitute and got about five minutes of action in stoppage time, as the squad held on to nail down the 2-0 victory. With the win, Vikingur Olafsvik moves into fourth place, two points behind Akranes and Þróttur, though they are still at a significant disadvantage against Akranes on goal differential. Olafsvik hosts Akranes next Wednesday, in what promises to be a key match. I haven’t done any match summaries this season, because finding any kind of recaps online has been darned hard. First world football blogger problems, to be sure. However, I have now tracked down a source – fotbolti.net – and with the help of Google Translate, will do my best to get back into the summaries. Vikingur Olafsvik came out firmly in control, with good possession and multiple scoring opportunities in the first half hour, but weren’t able to convert. KA Akureyri keeper Srdjan Rajkovic kept his side in the match, with some outstanding saves on Brynjar Kristmundsson and Friend of the Blog Eyþór Helgi Birgisson. In the 23d minute, midfielder Bjorn Palsson pulled up with a thigh injury, but returned to the pitch five minutes later. Finally in the 34th minute Eyþór beat his defender and lofted a ball into the box for striker Kemal Cesa to knock into the goal. Vikingur had more opportunities in the first half, mostly down the right side through Eyþór, but weren’t able to find the back of the net, and went in to halftime only up 1-0. Olafsvik stayed strong through the first 15 minutes of the second half, with Eyþór and Cesa continuing to abuse the left side of the Akureyri defense, but were continually denied by Rajkovic. In the 54th minute, Palsson finally succumbed to his injured thigh and was subbed off for the Pride of Hackettstown, Joey Spivack. Palsson’s departure seemed to give Akureyri some new life, as they started taking control of the midfield, taking advantage of Spivack’s newness to the squad. They weren’t able to find the back of the net, though, until the 71st minute, when KA forward Ævar Ingi Jóhannesson’s ball deflected off Tomasz Luba and into the Vikingur net. Four minutes later, though, Steinar Már Ragnarsson got the ball away from KA mid Edin Beslija and slipped through the Akureyri defense, slotting a shot neatly past Rajkovic to put Olafsvik back in front 2-1, and it looked like Vikingur was headed into a three-way tie for second place in the 1.Dield. KA pressed higher and higher up the pitch to try to grab an equalizer, and the action was end-to-end, with Gunnar Örvar Stefánsson hitting the crossbar off a corner in the 88th minute, and Vikingur breaking away in the other direction with Cesa being denied yet again after getting through one-on-one against Rajkovic. Finally, though, in the first minute of stoppage time, Ævar got a sliver of space away from Emir Dokara and found Gunnar in the box, who beat keeper Arnar Darri Pétursson to draw Akureyri level. It wasn’t over, though, as Eyþór kept pounding down the right flank trying to will his team to the victory; as the fifth minute of second-half stoppage time was winding down, he broke behind the defense but couldn’t find the back of the net, and the match ended in a 2-2 draw. The result leaves Vikingur firmly in the middle of the table, in fifth place with 19 points. They are only two points out of second place, but are well back of the other contenders on goal differential, at -1 compared to +12 for Akranes, +3 for HK Kópavogur, and +10 for KA. Major tip of the hat to Magnús Þór Jónsson of fotbolti.net for the real-time text summary that I used to construct this summary. The summer transfer window is open, and Vikingur has started making some moves. Defender Alex Vivancos was picked up from Massanassa CF, in Group 3 of the Valencian regional top division, one level below the Tercera Division. Vivancos has spent his career in Spain, reaching as high as Villajoyosa in Segunda B, as well as spending time with Acero and Alzira in the Tercera Division. Expect him to slot in at left back, effectively replacing Danny Herzig, who has left the team. Vikingur also picked up the pride of Hackettstown, NJ, midfielder Joey Spivack, who comes to the team from PS Kemi Kings in the Finnish Kakkonen Pohjoinen, in the third tier of Finnish football. Spivack appeared in 24 matches in each of the last two seasons for Kemi, and scored 5 goals in the two seasons. He has previously played for Guiseley A.F.C. in England’s Conference North, and spent time with the Red Bull New York Academy and Richmond International Academic and Soccer Academy (RIASA) in England. Both Vivancos and Spivack saw time in the match against KA Akureyri, with Spivack coming on in the 54th minute for Bjorn Palsson, who suffered a thigh injury earlier in the match, and Vivancos coming on in the 79th minute for Brynjar Kristmundsson.